I’m never sure what to expect from a Bill Frisell ensemble, other than confidence that it will be interesting, unique and full of surprise. His Beautiful Dreamers Trio thus did not disappoint when they took the stage last night at the Dakota Jazz Club for the third of their scheduled four sets over two nights. 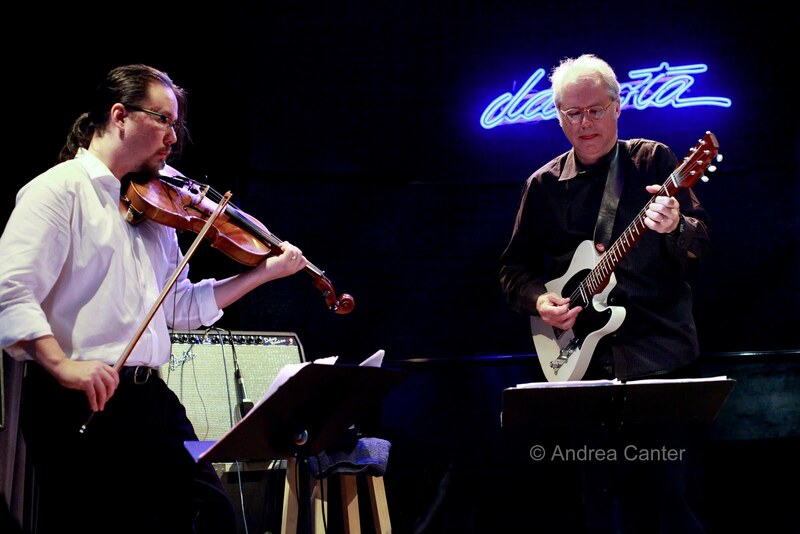 I’ve seen Frisell, perhaps the most inventive guitarist on the current jazz scene, in a variety of configurations over the past ten years, from quintet with cello, winds and percussion to quartet with trumpet to his recent Bagdhad/Seattle Suite trio with viola and oud. 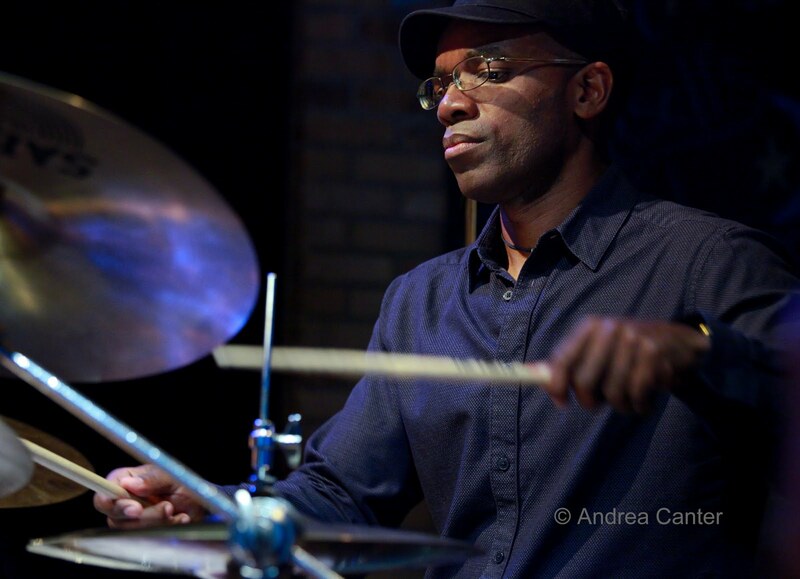 Beautiful Dreamers continues his collaboration with violist Eyvind Kang (Badghad/Seattle Suite) and drummer Rudy Royston (Quartet). It’s an aptly titled ensemble, bringing forth dreamy trances and melodic floatations as string experiments ride in tandem with dark and stormy percussion, hints of nightmare ultimately washed away by celestial resolutions. The music expands as the trio adds layer upon layer as if building an organic onion of sound. The first composition (which I suspect was largely improvised in the moment) moved along for about thirty minutes, initially suggesting a modern classical form with Middle Eastern themes inserted. All three musicians engaged in continuous music-making, guitar and viola often in odd harmonic partnership while Royston added layers of shimmering sound curtains over a throbbing rock-like beat, creating at one point a haunted “House of the Rising Sun” feel. Kang provided a wide assortment of both acoustic and electronic sound effects, one minute like crunchy static, the next minute a string calliope. 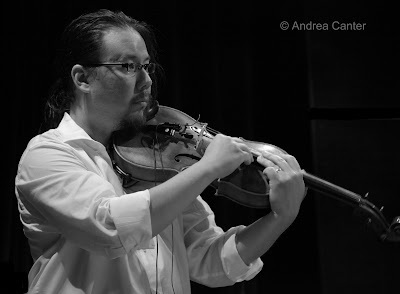 Frisell and Kang ultimately fell into a sequence of scale-based patterns, intermodulating until reaching a sudden stop. Unlike any other project from Frisell or anyone else, the Beautiful Dreamers redefines sonic beauty as much as it redefines the jazz trio. 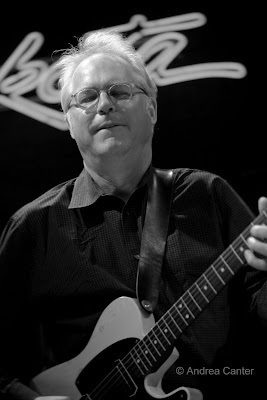 Not one to hold on to labels, Bill Frisell adds yet another idiom to his unique musical lexicon. Call it free quasi-tonal electro-jazz/folk/global mania. Or just call it oddly beautiful. Photos: Bill Frisell; Eyvind Kang; Rudy Royston; Kang and Frisell. (All photos by Anrea Canter at the Dakota, July 13, 2010).